Transforms static IP data and behavior patterns to uncover and identify potential fraud and security threats. 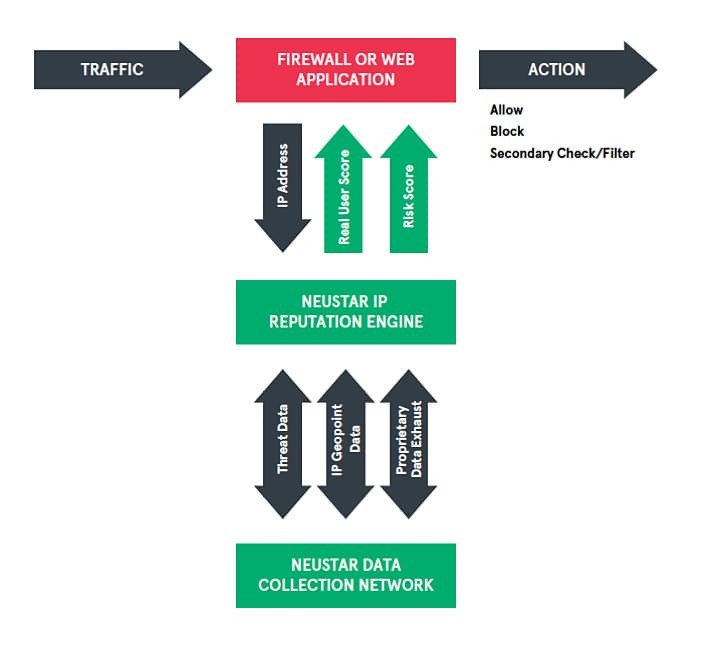 Neustar's IP Reputation is the authoritative source of risk and threat scoring data for IP addresses worldwide. We analyze billions of daily global queries from a variety of industries including financial services, streaming media/OTT content distribution, advertising, insurance, gaming, government and healthcare. So, when a decision is made to identify an IP address as fraud risk or a security threat, you can be confident that you're using the most insightful IP Reputation data available. With risk insight from IP Reputation data, you can determine if the IP is being used by an actual human being or is non-human bot or server traffic. You can determine if the IP address has been associated with malicious activity in the past and is too risky to trust, the history of the IP address and the last time it was seen, and if its risk profile has changed since the last time it was seen. We assign a score between 1 and 5. To arrive at this score, we analyze usage patterns across key industries as well as collection of non-human activit (e.g. server and botlists) to differentiate real end-user (human) traffic from non-human (server or bot) traffic. The higher the number (e.g. 5), the more likely the traffic is "non-human." The higher the number, the more likely the traffic is "non-human"
Integrating IP Reputation data into a Threat Intelligence/Cybersecurity platform decisioning flow enables you to uncover cybersecurity threats, detect and block non-human intrusions, identify malicious traffic, and stop spam/phishing attempts. 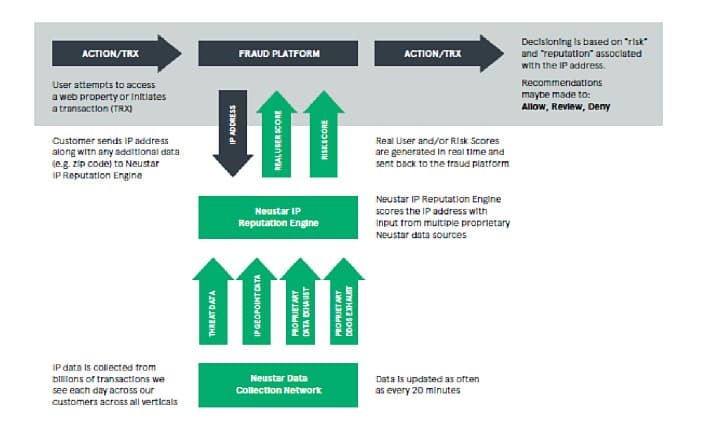 Integrating IP Reputation data into a fraud platform allows you to identify malicious traffic and block risky IP's from network access, identify "non-human" or bot traffic, identify fraudsters and "bad-actors" to prevent online/CNP fraud, and deliver a better experience at every touchpoint throughout the customer journey.